The presence of variety of plants in the form of different tans (specie, genera) is called diversity of plant. Different plants have different morphology, physiology, cytology and anatomy. It produces diversity among plants. Diversity includes classification and nomenclature of plants. categories on the basis of similarities between them. The group of animal with similar characteristics forms a taxon. For example, Amaltas (cassia fistula) shows similarities with other cassia specie (cassia senna). Both have compound leaves and produce bean. Therefore, all such plants are placed in the same taxon. Moreover. Cassia also shares characters with Bauhinia verigata (Kachnar). So they are place in the same family. Carolus Linnaeus did not accept evolution. But still many of his groupings show evolutionary relationships. Morphological similarities between two plants have a genetic basis. It gives rise common evolutionary history. Thus the plants are grouped according to similar characteristics. Carolus Linnaeus grouped them according to their evolutionary relationships. The members of the same taxonomic group are more closely related to each other than the members of different taxa. Protista Members of the kingdom Protista are eukanjotic. They consist cf single cells or colonies of cells This kingdom includes Amoeba. Paramecium, etc. Plantae: Members of the kingdom Plantae are eukaryotic, multicellular, and photosynthetic. Plants have walled cells. They are usually non,motile. motile. Mode of nutrition distinguishes fungi from plants. Fungi are decomposers. Fungi digest organic matter outside the body and absorb the broken products. 5. Animalia: Members of the kingdom Animalia are eukaryotic and multicellular. They feed by ingesting other organisms or parts of other organisms. Their cells lack walls and they are usually motile. environment such as high temperature rift valleys on ocean floor, or high-salt or acidic environments. All members of the Archaea inhabit anaerobic environments. These environments show the conditions on the earth at the time of origin. The Archaea are the most primitive life form. Ancient Achaeans gave rise to two other domains of organisms. Eubacteria: These include true bacteria. These are included prokaryotic microorganisms. Eukarya: The Eukarya include all eulcaryotic organisms. The Eukarya diverged more recently than the Eubacteria from the Archaea. Thus, the Eukarya are more closely to Archaea than the Eubacteria. It includes the other four kingdoms of eukaryotes: Protista (Protoctista), fungi, Plantae and Animalia. Nearly all plants reproduce sexually. Most plants are also capable of asexual propagation. Plants produce their gametes within gametangia. Gamentaniga has protective jackets of sterile (non-reproductive) cells. It prevents the delicate gametes from drying during their development. The egg is fertilized within the female organ. The zygote develops into an embryo. Embryo is retained for some time within the jacket of protective cells. Alternation of generation occurs in plants. The phenomenon in which haploid gametophyte generation and diploid sporophyte generation alternates with each other is called alternation of generation. It occurs in all plants. The sporophyte and gametophyte generations differ in morphology. So they are heteromorphic. Diploid sporophyte is the more noticeable individual in all groups. There are two one main trend in the evolution of plants. adaptation was formation cuticle and jacketed gametangia. It protects gametes and embryos. 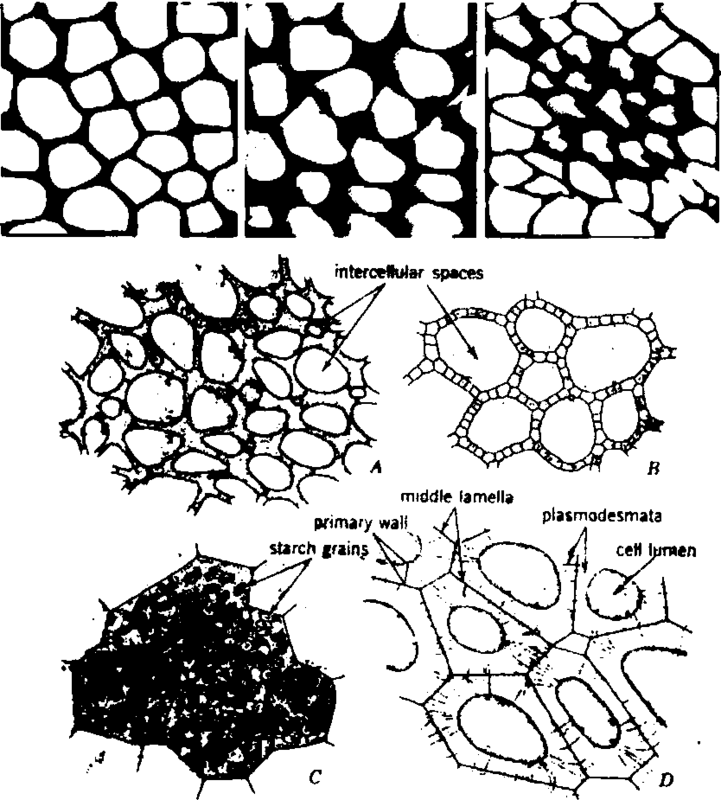 Then evolution of vacular tissue takes place. Vascular tissues consist of cells joined into tubes. Vascular tissue transport nutrients throughout the plant. Vascular tissue evolved relatively early in plant history. Most mosses lack vascular tissue. Therefore, they are called nonvascular plants. However, water conducting tubes are present in some mosses. But it is not clear whether tubes of mosses are analogous or homologous to the water-conducting tissue of other plants. present in ferns and a few other groups of vascular plants. 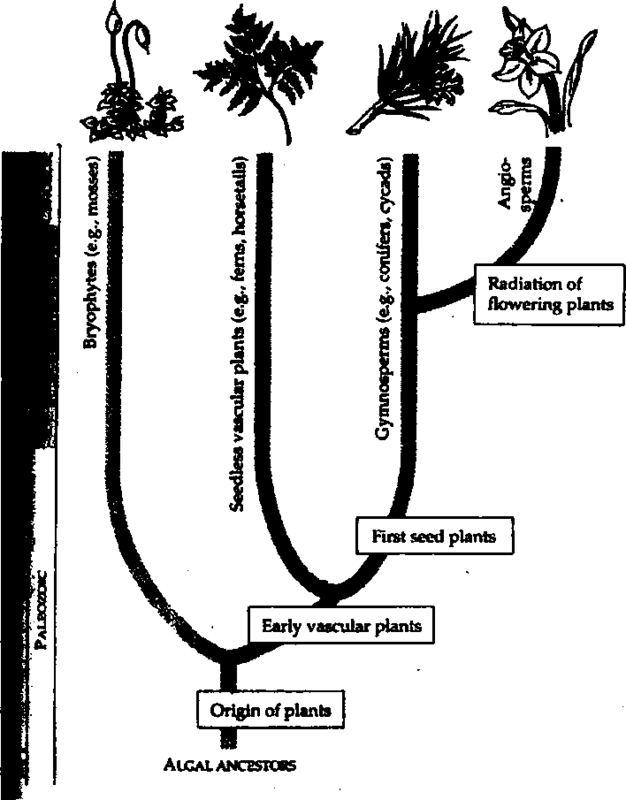 Third period: Evolution of Seed: The third major period of plant evolution begun with the origin of the seed. Some Seed protects .embryo from desiccation and other hazards. A seed consists of an embryo packed ovule along with store of food within a protective covering. The first seed producing vascular plants arose about 360 million years ago, near end of Devonian period. These plants have naked seeds. They are not protected by covering. These plants are gymnosperm (conifers). They include pines and other cones. Gymnosperms coexisted with ferns and seedless plants for more than 200 million years. Fourth period: Evolution of flowering plants: Flowering plant evolved about 130 million years age during early Cretaceous period. The flower is a complex reproductive structure. Their seeds are protected within fruit. The flowering plants are called angiosperms.